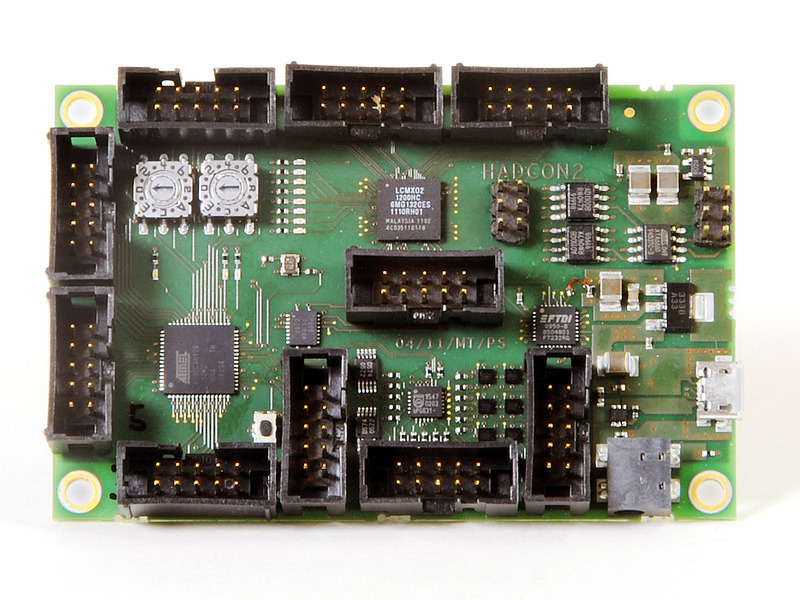 HadCon2 is a credit-card sized general purpose I/O module for detector and experiment controls as well as for small data acquisition systems. It is the successor of the discontinued first version HadCon ( HADControl/HadShoPoMo general purpose board, HadCon @ Epics Wiki). I2C (8/4 fold (intern/extern) multiplexer), 6 channel 1-wire master, 8-channel 8bit DAC, galvanically isolated CAN - high-speed transceiver, 8-channel 10-bit SAR ADC, byte-oriented SPI, in total up-to 53 programmable I/O lines and optionally a Lattice MachX02 FPGA for fast data processing tasks. It doesn't have any CPU on board, but a USB connector to directly allow communication with any type and size of computer (e.g. PC, raspberry PI, dreamplug, ...) having an USB port on one side and at the other end the microcontroller and the FGPA. This communication is based on an ASCII-based protocol in view of easy implementation in detector control systems like e.g. EPICS and LabVIEW. ATMEL's SDA/SCLsignals are multiplexed to up-to 8 lines. The configuration can be set via I2C. Connected to ATMEL's pin PB5 (OC1A) [...] pulling the RESET pin LOW resets the I2C -bus state machine causing all the channels to be deselected, except Channel 0 so that the master can regain control of the bus (from the manual]. "To optimize 1-Wire waveform generation, the DS2482-101 performs slew-rate control on rising and falling 1-Wire edges and provides additional programmable features to match drive characteristics to the 1-Wire slave environment." "Programmable, strong pullup features support 1-Wire power delivery to 1-Wire devices such as EEPROMs and sensors." When driving 1-wire devices, typically via JOWIO1, make sure to have (at least) 1 pull-up resistor of about 3.3kΩ on the data line of the 1-wire bus connected to the power VDD. Recommended to have it at the master, e.g. at HadCon 's connector JOWIO1,. Possible option for future, directly at the connector, when using one of JDINOUT2'spins as permanent power pin. Since Single-Channel 1-Wire Master DS2482 is used at JOWIO1, this isn't necessary anymore, but keep in mind for other applications.